Your eye on the world. Of Waltzer. 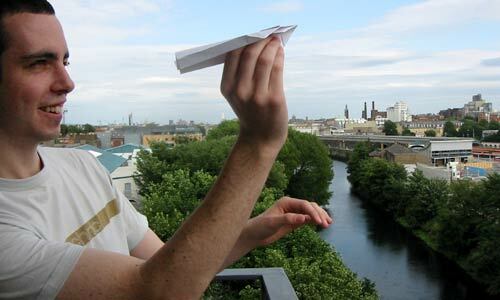 Rurai throws a paper plane out into the city. The lads spent ages making planes from instructions downloaded from the web. This week marks the year anniversary of the late, great Ian Kane. Kaner was a good friend of mine, and of most of the people I hang out with. He is still very much in our hearts and minds even though a year has passed since the day of his fatal motorbike accident. We all remember Ian as being great fun, a bit crazy and always enjoying the lighter side of life. He was inspirational, engaging, and a respite to the tedium of working life. The most important thing in life is happiness, and Kaner brought it in abundance to those around him. To remember Kaner in a way he would have enjoyed, Mandy suggests we meet up and have a few jars in his honour. At present we think the Life bar at 7 on Thursday (12th). Mandy will send some mails out today to the addresses she has. If there is a change of venue I will notify you here. Feel free to come along. I only took a few photographs this week so I mixed them with some from the past few months. These are shots that didn't really fit in well with any other week because there wasn't enough in the series, but are still worth putting up anyway. So I hope you enjoy them! This week I applied for a college course in Griffith College. The course is a two-year part-time certificate in Photography, awarded by City & Guilds. I am really looking forward to starting, and I hope that any of you who enjoy my photography here each week will wish me luck. I will definitely be putting up any college work onto this site, and keeping you informed about how I'm getting on, etc. This week John Grant is off to Oz to visit our two mates there, Trinity and Joey Rainbow. The girls are no doubt looking forward to seeing the Derry man, who will be spending a year down under. Some of the crew are making the awkward journey to Slane castle to see Stereophonics, Doves, Nickelback and Counting Crows. Should be a good gig and hopefully we'll get some good shots and stories. Probably not as shocking as last year's story! Brian and I will be heading off to London in a couple of weeks to see the retro computer game exhibition, Game On, in London. We'll be out on the town also, so hopefully some interesting photos there too!